What is Fathers Day for? To acknowledge and appreciate the man who participated in the creation of your birth. It’s to acknowledge what he did and did not do to guide you, as best he could. It’s to remember the special moments of connection when you felt like you mattered most. Fathers Day is to honor the man who loved you, as best he could, and put up with all your imperfections as you find your way in this world. It’s to honor the imperfections in him as well. It’s to remind him of how loved he is regardless of his ability to accept or appreciate the love you have to offer. Fathers Day is perfectly suited to open our hearts to the immense challenge of bringing another human being into this world. It’s a day to remember that no matter how imperfect your father was, he really was doing the best he could with the information and resources he had at the time. It’s a day to consciously suspend judgment and accept our father as he is, even if it means shattering the storylines we’re given about what a good father does or does not do. This does not mean we have to agree with these (in)actions. It simply means accepting him for all he is. Whether your father is addicted to drugs or hugs, he is your father and perfectly suited to help you grow closer a power much greater than yourself. No one can ever replace him. He did (or in some cases, is doing) the best he could within the confines of what it means to be human, with often devastating fears. Being a father easily brings forth remarkable pressure to meet some preconceived notion of what it means to be a good person. If by the stroke of luck you get a perfect father, according to societies definition or whoever is judging in the moment, this day is perfectly suited to celebrate your beloved father. 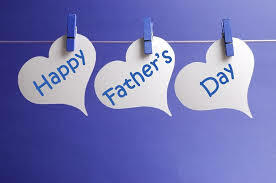 If, on the other hand, your dad is far from perfect, today is perfectly suited to celebrate the opportunities you’ve had to learn the immense gift of every kind of father.